Can't find a tool when you need it? Is your garage swimming in a sea of unruly power cords & stuff? These power tool storage ideas will help you find peace. Sometimes it can feel as if your garage or shed are being taken over by power tools. Cords spill out over every surface. Batteries need to be hunted down and you can never be quite sure of where you last put down that power drill. While your garage or shop may never resemble an episode of your favorite home improvement show, it can resemble less of an episode of Hoarders! From power drills to circular saws, we’ve found storage solutions that cut down on clutter, eliminate lost time searching for tools and attachments, and maximize your usability and space. Who knows? You might even find that your honey-do list finally gets crossed off! Regardless of your space or project needs – we have power tool storage ideas for everyone. Whether you need a mobile solution that can go from your garage to the project site, or some tool box organization ideas that make use of empty garage wall space – we’ve compiled a list of your best options. Peruse our list, dig through your tools for the ones you need, and let’s get started. Don’t just store your power tools – with this great option charge them all at the same time! To provide the juice for your charging station, these types of power strips will do the trick. The drawer is a great bonus for storing drill, bits, screws and other accessories. Learn more: here. It can get pretty irritating having to shuttle back and forth to grab the tools and other supplies you need when working on a project – especially when it comes to car repairs or other detailed projects that require working with a wide variety of tools. This great option allows you to take your work station with you wherever you go around the house. Freedom and convenience are everything, and this project gives you both. The creator mentions you that can find a good set of caster wheels online. You really can’t have a DIY list without at least one repurposed pallet project. Pallets are ridiculously versatile when it comes to project needs and in this case – incredibly stylish as well. We love the fact that you can add shelves, drawer spaces, and other options as needed while still keeping this great, rustic look! Find out how here. This great wall unit frees up space on your work bench and in your cabinets while keeping all your power tools organized and within view. That’s always a winner in our books! Download the free project plans here. You might already have a coat rack hanging out in your garage as it awaits its destiny at your next yard sale. Put it to good use by repurposing it to hang your power tools instead. If you don’t have a coat rack on hand, these plans can help you design your own hanging storage system. This might be the simplest and most comprehensive way to store all of your tools and supplies in one place. What’s amazing is that this idea only uses 5.5” of depth and the pegboard can be cut to fit whatever size wall you have available. From power tools to step stools, you can find a spot for everything to hang out using the great ideas here. Create a stunning piece that can be used as tool storage or functional furniture within the home. This beautiful and handcrafted armoire is time and labor intensive, but the pay off is a design that just might be too pretty to keep in the garage for tool storage. Find out more here. A storage and charging solution that is quick and easy to create and it only costs $20? We aren’t pulling your leg – it really does exist! French Fries, French Vanilla – all the best things have French in them! 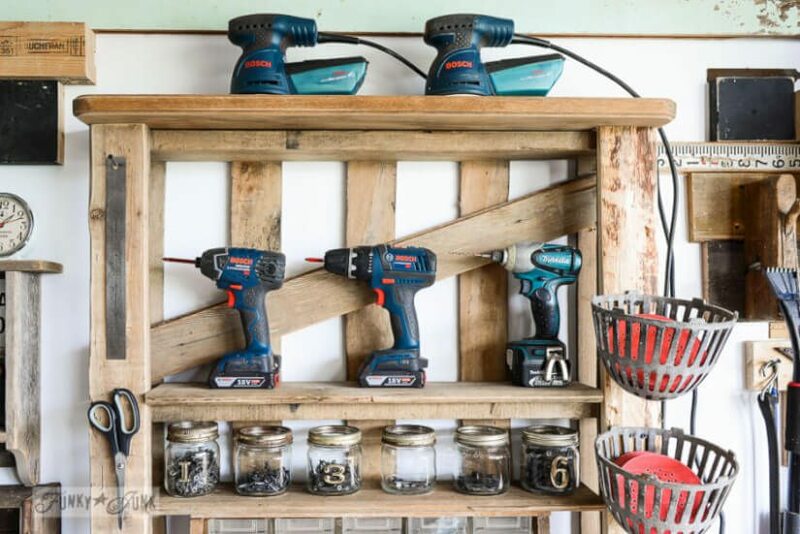 French Cleats are a creative and resourceful way to hang your power tools and use up much of that scrap wood you have hanging around your house. From drills to skill saws, this system can be customized to the size and shape needs of your tools. The hooks for the cord storage are another nice touch. Find out more here. We love that this storage solution is compact but versatile enough to even accommodate your air compressor. Miter saws, hammers, and other accessories all find a home on this rolling cart that can slide up alongside your work space. Learn how here. “Grab and go” storage at its best. This storage option not only has space for all your tools, it also includes a pull out table that you can use for sorting tools or small projects. The casters allow you to roll your tools around the garage while the drawers can be removed and moved to your work space. Find more details about this mobile DIY tool chest here. Ana White ideas are always so versatile and functional. These plans really do create the ultimate workbench. Space for bench tools, table saws, and a way to tuck it all away at the end of the day. Full details here. It’s pretty amazing when you can unfold an entire workshop from a compact cabinet. Built-in lighting, a removable vise, and an 8’ workbench all fit within this storage option that only takes up 6′ when closed. Order plans here. 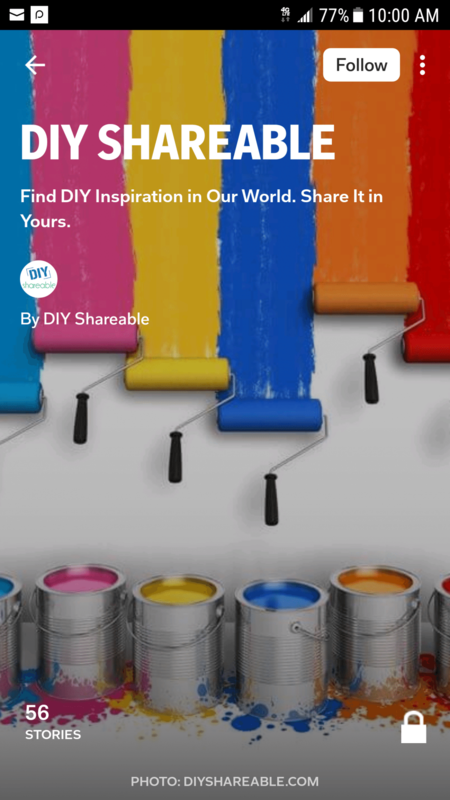 Most DIYers can agree that nothing is better than a project that uses materials you already have on hand! This DIY tool storage option using PVC pipe fits that bill. Notch PVC pipes out to fit your power tools and mount to a wall or under a shelf. You’ll instantly have an organized look and free up shelf space. Use larger diameter pipe for larger tools like circular saws. Find out more here. The best part of DIY projects is that they can be expanded upon and adapted to fit your exact needs. Don’t forget to check what you already have that can be transformed into a storage solution! Old furniture, the scrap pile of former projects – they all have a future as storage options in your garage or shed. Did you have a favorite on this list? Did you tackle one of these options or design your own “chaos-calmer?” Let us know! We love seeing before and after pictures of your projects – it’s the best way for us all to learn from each other. Don’t forget to share these ideas with friends as well!